Groundhog day was a little over two months ago. However, this is the time of year when they usually start to make their appearance, emerging from their dens following a long winter of hibernation. Until last Monday – when winter reared its ugly head, once more – it looked as if we would be seeing these little rodents soon. They may have rethought their intentions, and gone back to sleep. Groundhogs, Marmota monax, also known as woodchucks, are a rodent, belonging to the group of large ground squirrels known as marmots. It was first scientifically described by Carl Linnaeus in 1758. 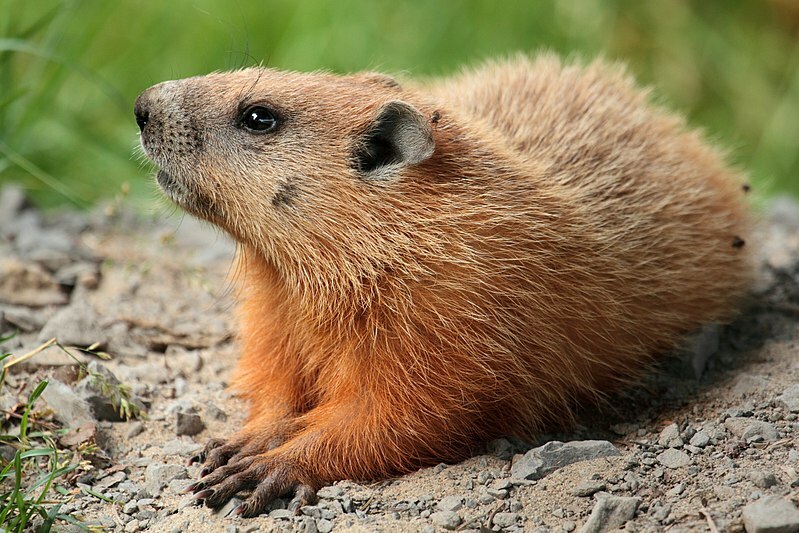 The groundhog is also referred to as a chuck, woodshock, groundpig, whistlepig, whistler, thickwood badger, Canada maramot, monx, moonack, weenusk, red monk, and, among French Canadians in eastern Canada, siffleux, which translates to whistler. They are a lowland creature, found through much of the eastern United States across Canada and into Alaska. Adults are 16 – 20 inches long, including a six-inch tail, and weigh between 5 – 12 pounds. Extremely large individuals can weigh as much as 15 pounds. Groundhogs prefer open country and the edges of woodlands, and is rarely far from a burrow entrance. It is typically found in low-elevation forests, small woodlots, fields, pastures and hedgerows. It constructs dens in well-drained soil, and most have summer and winter dens. In the wild, groundhogs can live up to six years, although three years is the average. In captivity, they can live up to 14 years. Humans, dogs, coyotes and foxes are about the only predators that can kill adult groundhogs, with the red fox being the major predator. Young may be taken by owls and hawks. According to studies, despite their heavy body weight, they are accomplished swimmers and will occasionally climb trees to escape a predator. They prefer to retreat to their den when threatened, and will defend themselves with their incisors and front claws. They are territorial among their species and will skirmish to establish dominance. When alarmed, they will use a high-pitched whistle to warn the rest of the colony, hence the nickname whistlepig. They will also squeal when fighting, seriously injured, or caught by a predator. They will also produce a low bark and a sound produced by grinding their teeth. They are excellent burrowers, using the burrow to sleep, rear their young, and hibernate. An excavated den can remove about six cubic feet of soil, on average, or almost five bushels per den. They are relatively large and include a sleeping berth and an excrement chamber. The burrow is used for safety, retreat in bad weather, hibernating, sleeping, love nest, and nursery. Groundhogs are one of the few species that enter into true hibernation. In most areas they hibernate from October to March or April. They drop their body temperature, the heart rate falls to 4 – 10 beats per minute and breathing falls to one breath every six minutes. Researching the hibernation patterns of groundhogs may lead to benefits for humans, including lowering the heart rate in complicated surgical procedures. Groundhogs are already used in medical research on hepatitis B-induced cancer. Humans can’t receive hepatitis from woodchucks but the virus and its effects on the liver make the woodchuck the best available animal for the study of viral hepatitis in humans. The only other animal model for hepatitis B virus studies is the chimpanzee, which is an endangered species. Always thought to be a nuisance species, groundhog dens often provide homes for skunks, red foxes and cottontail rabbits. The fox and skunk feed upon field mice, grasshoppers, beetles and other creatures that destroy farm crops. In aiding these animals, groundhogs indirectly help the farmers. Well, I had a groundhog living near my garden a few years ago, and he unceremoniously cleaned out all my string beans. Well, I unceremoniously captured him in a Hav-a-Hart trap, and relocated him to the wild, and wished him the best of luck. Before Mookie Betts, who was the last Boston Red Sox player to win the American League batting title?